With the advent of the General Election a matter of weeks away, a BBC broadcast special was aired on the Breakfast News last Monday. Using a nominal number of 100 voters, BBC Presenter, Dan Walker guided viewers through the key voting predictions for the forthcoming elections. Looking to source the perfect visual prop for the filming, BBC researchers contacted Manchester based company, Words To Glow for help. 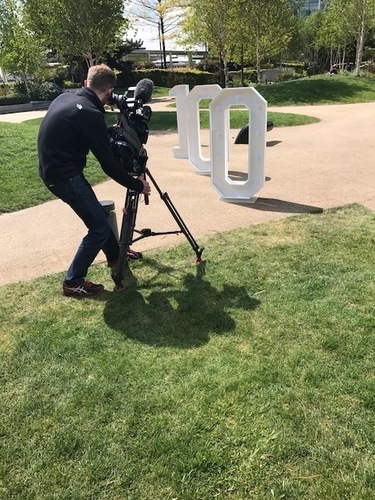 With light up numbers as well as their extensive letter light range, the company was well placed to provide the giant number ‘100’ for the occasion. As the second time Words To Glow have worked with the BBC; the demand for their hire products for corporate branding and prop hire is clearly on the increase. Of course, with every letter of the alphabet, numbers and a hashtag too, the company is ideally placed to respond to corporate requests for event branding. Manchester Central, a recent client and an award winning venue in the heart of Manchester city centre is currently celebrating a decade of success following their high profile rebrand. Aiming to launch a series of celebratory events throughout 2017, the team at Manchester Central were looking for creative ideas to capture both memorable and defining imagery for their marketing and promotional materials. Following consultation, a photo shoot was arranged, aimed at defining the brand that signifies Manchester Central; whilst simultaneously highlighting the beautiful architecture of this iconic station. Providing the perfect photo opportunity, Words To Glow letters lit up the iconic station with beautiful letter lights spelling ‘#MC10’, its famous arches and station clock forming the background. The resulting images successfully establish Manchester Central’s brand and the pictures are now actively being shared across Manchester Central’s social networks. Words To Glow provide innovative and bespoke event hire products for corporate clients and private hire. Future corporate hires include working with Manchester based Dreamscope TV, based in the old Granada Studios. Helping to launch future tech for television and film, Words To Glow products are once again proving to be the perfect on-brand focus and promotional tool for this forthcoming event. The Northern based company continues to attract business to business partnerships and preferred supplier status. Based in the heart of Manchester and supplying event prop hire across the North West, Words To Glow specialise in creating beautiful and bespoke LED wooden signs for any occasion. Our large collection of handmade wedding & event prop hire provides the perfect backdrop and romantic lighting for your special day. Hire our fabulous 4ft x 2ft illuminated letters to add that sparkle to your wedding day or occasion. With every letter of the alphabet and numbers too, with our marquee letter lights you can spell anything you desire…the only limit is your imagination! From our ever popular LOVE letters to MR & MRS, DANCE, PARTY or even your initials, our letter lights can be ordered to your specification. This press release was distributed by ResponseSource Press Release Wire on behalf of Words To Glow in the following categories: Entertainment & Arts, Women's Interest & Beauty, Media & Marketing, for more information visit https://pressreleasewire.responsesource.com/about. Based in the North West, Words To Glow Light Up Letters & Venue Decor specialise in beautiful and bespoke vintage letter lights and signs for any occasion.